Plans to make Rosslyn a bit easier to navigate for pedestrians and bicyclists are coming together, though county officials are concerned that some of the proposed changes might further snarl traffic in the area. The county unveiled its latest designs for future of the “Core of Rosslyn” at a public meeting last Tuesday (Oct. 2), which includes plans to convert several streets around the Rosslyn Metro station into two-way roads, remove the Fort Myer Drive tunnel under Wilson Blvd and add a host of new connections for cyclists and walkers. 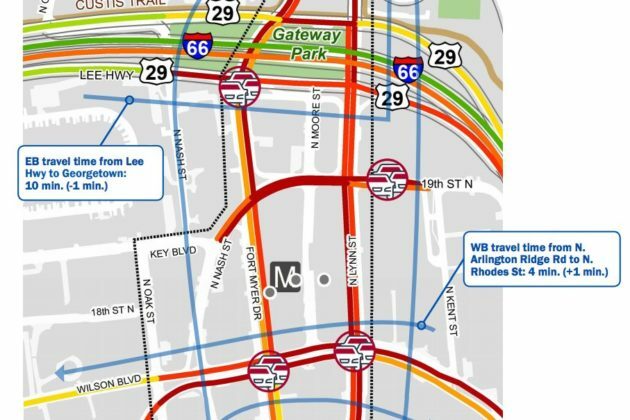 However, transportation planners worry that these alterations will produce “significant increases in gridlock” over the next decade or so, according to meeting documents. In all, they’re projecting that the proposals will increase wait times at intersections in the neighborhood by a total of 19 minutes during the morning rush hour (with especially acute problems at the already jammed intersection of the Key Bridge, G.W. Parkway and Lee Highway) and a total of six minutes during the evening rush. They’re hoping to refine these designs in the coming months to address those issues, while maintaining the positive parts of the plan. Certainly, planners expect the changes will result in substantial improvements in Rosslyn’s offerings for people who aren’t relying on cars to get around. The designs included 14 new or improved crosswalks for pedestrians, and more than 1.3 miles of new protected bike lanes included in the design. The lanes, largely set to run along Fort Myer Drive, N. Moore Street and N. Nash Street, are designed to ease bike connections to the Key Bridge and Mt. Vernon and Custis Trails. 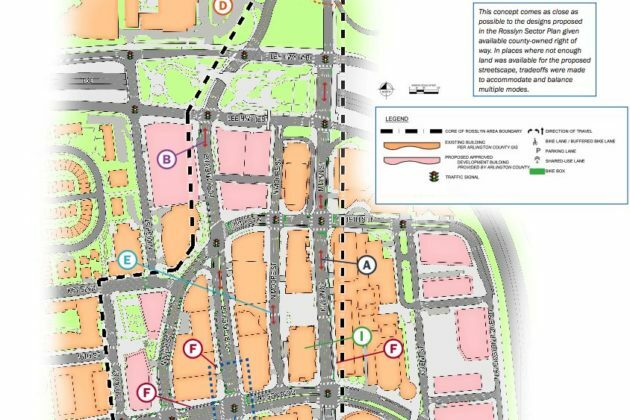 The plans also keep alive the county’s long-considered possibility of building a car-free, “pedestrian corridor” running from 18th Street N.’s intersection with N. Oak Street to N. Kent Street, a change that would replace the Rosslyn skywalk system to make the Metro station more accessible. Yet the county expects that this design would create some new challenges for walkers and cyclists as well. In particular, allowing two-way access on roads like N. Fort Myer Drive, N. Lynn Street and N. Kent Street will create a host of new “conflict points,” where cars are turning across crosswalks, prompting further delays for all involved. That’s why Arlington officials are still accepting feedback on tweaks to the design. Among the questions they want answered is whether people actually want to see the Fort Myer Drive tunnel filled in and transformed into a regular, signalized intersection with Wilson Blvd. The change would prompt additional delays at the intersections, and would involve “extensive construction costs and [a] long timeframe,” but could make it substantially easier for people to access the Rosslyn Metro station. Similarly, planners want to know if making N. Lynn Street a two-way road is worth the extra traffic headaches it might entail. The county projects that the change “reduces confusion and allows for more direct routing” if it’s put in place, but it would also force officials to find new access points to the G.W. Parkway, I-66 and the Key Bridge. The county plans to finish collecting feedback by Friday (Oct. 12), then unveil revised designs in the coming months. Officials hope to have final study recommendations for the area ready by sometime this winter.